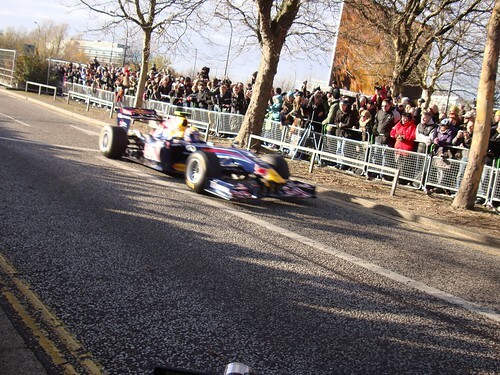 After another great year in Formula 1 for Red Bull, the team decided to put on a show in Milton Keynes (where the team is based). A large stretch of road going from Milton Keynes shopping centre down to Milton Keynes Central Railway station was sectioned off for the event. After finding out about the event I decided to pop along. It was pretty cold but there was a pretty good turn out. Both Red Bull drivers Mark Webber and current champion Sebastian Vettel showed up and did a quick lap in their F1 cars. There was also a motorcycle display which included a backflip off a moving bike and former F1 and Red Bull driver David Coulthard driving a Nascar style stock car. The event was great and I don't think I'll be able to get that close to a moving F1 car ever again.